Soya milk or soy milk is no alien term for people anymore. It is easily available in your neighbourhood grocery store or supermarket. Not only that its popularity has been increasing in the last few years. With more and more people opting for vegetarian and vegan lifestyle, soy milk is fast becoming a good source of protein for those who can’t take dairy. Lactose intolerence or dairy allergies which were unheard of when we were growing have become a reality these days and many young kids have problem with regular cow’s milk. In their case, soya milk and its products are recommended by doctors. One factor that deter a lot of us is the cost and the added sugar and flavourings in commercially available soya milk. All these concern can be easily addressed by making homemade soy milk. 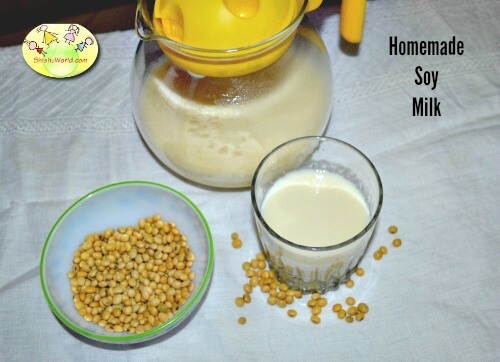 I recently came to know how easy it is to make homemade soy milk and decided to share it with you all. This homemade soy milk can be had straight or can be used in many recipes. It can also flavoured with many natural flavours. This milk can also be made into homemade soya paneer or tofu. It can also be used to make desserts, smoothies etc. Soak the beans for 10-12 hours or overnight in water. In morning, rub between hands to remove as much hulls or shells as possible. Discard the hulls. Now put the dal in blender with 2 spoons of water. Add 2-3 spoons of water as needed to make paste as smooth as possible. This will take anywhere between 3-5 minutes. Place the muslin cloth over a large strainer an a large bowl. Strain the ground soybean and squeeze out all the milk through the muslin cloth. Transfer the milk to a saucepan big enough to hold all the milk with enough room for boiling. Place the pan on medium heat bring to a boil while stirring off and on. Do not leave it to boil as it will bubble over just like regular milk. If you see any foam forming on top, skim it using a spoon. Once it boils, add a pinch of salt to it. You may also add any flavourings to this at this point. Let it simmer for about 15 minutes while keeping an eye. Let the milk cool down. You may store this for 2-3 days in fridge. Homemade soya milk ensure it contains no added sugar syrup or artificial sweeteners, preservatives or additives and no thickening agents. Soya is the best source of vegetarian protein. It contains more than 40% protein and is the only legume to have all 8 amino acids. Soya is also rich in Calcium, though most commercially available soya milk is fortified with calcium as a lot of it can be lost in processing. Soya milk can easily be used in most of your cooking where you want to replace regular milk. Soya beans look a bit like black eyed peas, but are a little smaller. You may add ground dates to milk at the time of simmering to add natural sweetness to the milk. You may add less or more water to make the milk thicker or thinner as per your preference. This is very useful. I always thought of making Soy Milk at home. We can also make tofu using the same soya milk, if I am not wrong. Thanks for well explained recipe. Thank Sapana! Yes, tofu can be made with homemade soy milk. I have tried it myself and it turns out very well.